The crucifixion of Jesus gives us one more important relationship that Jesus experienced on the road to the cross. Let's learn the dynamics from the time fate found Christ before Pilate. Please read Luke 23:1-25 before starting GraspingGod.com's free Bible study lessons, #2.19. Previous lesson: St Paul the Apostle #2.18. 1) Was Jesus properly tried, convicted and sentenced, or was he murdered? 2) Was Pontius Pilate innocent or guilty in Jesus' physical torture and death? 3) Why didn't Jesus seek to defend himself? The trial of Jesus Christ brought him before Pilate, Roman governor of Judea. We can learn a lot about ourselves from observing how this relationship developed and ended in the crucifixion of Jesus Christ. The crucifixion of Jesus was an assassination plot originated from within the Sanhedrin (aka The Council). The Sanhedrin was the highest ruling assembly among the Jews. 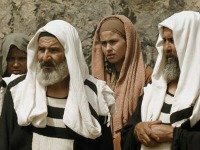 The Sanhedrin was also the court of justice, which consisted of 71 members, made up of Sadducees (aka chief priests and elders) and the Pharisees and scribes. The Sanhedrin was headed by the high priest of Israel. Many people believe that the Apostle Paul (Saul at the time) was a member of the Council, but there is no documented proof. Some members of the Sanhedrin, who we know from the Bible, are Joseph of Arimathea (Mark 15:43), Gamaliel (Acts 5:34), Nicodemus (John 3:1, 7:50), the high priests Annas and Caiaphas (Luke 3:2) and Ananias (Acts 23:2). The Roman emperors granted the Sanhedrin limited authority over certain religious, civil and criminal matters, especially in Jerusalem. The Bible records the fact that Peter and John were tried by the Council (Acts 4:1-23). Joining them in persecution were other apostles (Acts 5:17-41), Stephen (Acts 6-7) and Paul (Acts 22-24). Fortunately, the Romans denied the Sanhedrin the power of capital punishment, which greatly troubled the Jewish rulers, limiting their authority. They realized their desired crucifixion of Jesus wasn't fully in their hands. Pontius Pilate and the Sanhedrin were involved in a tense power struggle, which led to many of the decisions and outcomes at the trial of Jesus Christ. Pilate had entered his governor's position years prior and instituted some unwise policies in Jerusalem. He experienced several revolts by the Jews and he was severely castigated by Caesar, the Roman Emperor. Pilate, at the time of Jesus' trial, was walking on very thin ice in regards to maintaining his governorship. In fact, several years after Jesus' trial he was removed from his post, being called to interrogation in Rome. He had ordered the slaughter of a sect of a Samaritan religious group, who were actually peaceful and posed no threat to Pilate. Tiberius Caesar died before the trial and no records exist of Pontius Pilate's trial or his whereabouts after the emperor's death. Tradition says that Pilate committed suicide, but no details are known. Let's return to the crucifixion of Jesus. His unofficial trial before the Sanhedrin took place during the night, which was illegal in itself. The plot, beginning with Judas' betrayal, started late the prior evening. The arrest was successful and The Council quickly gathered to "try" Jesus. The fact that the Passover was beginning escalated the urgency to crucify Jesus. The Jewish leaders weren't able to enter Pilate's Praetorian and remain pure for the Passover celebration - so the sooner they could murder their Messiah, the better. The Council quickly charged Jesus with blasphemy for calling himself the Son of God. Although the real reasons for their hatred of Jesus are found in John 11:45-53. Jesus was brought to Pilate very early in the morning. Pilate tried to shake off his early morning sleepiness. He slowed the trial process down, because he was suspicious the Sanhedrin was trying to force matters. Pilate asked for the official indictment. The Council knew blasphemy probably wouldn't lead to the crucifixion of Jesus, so they hurled additional charges at Pilate. They basically charged Jesus as a rebel-rouser and evil-doer. The governor initially didn't want to deal with this situation, nor did he desire to upset The Council. Pilate told them to go ahead and try him, sentence him and punish Jesus as their laws dictate. He thought they would stone Jesus, which would be the end of the situation. Stoning wasn't good enough for the Sanhedrin, they sadly wanted Jesus Christ to suffer through a Roman crucifixion. Jesus knew it was coming (Psalm 22:1-31; Matthew 20:18-19), remaining calm and focused on his mission. The Sanhedrin had an evil motive for handing Jesus' condemnation over to the Roman government: They desired that the Romans have the sentence and punishment on their records, not the Sanhedrin's. The religious leaders knew how popular Jesus was and they didn't want the responsibility for the crucifixion of Jesus hanging over their organization. Suddenly, it was Jesus Christ before Pilate, standing accused of breaking religious laws before a governor who didn't believe blasphemy, or the other additional charges, should lead to a death sentence. What does Pilate do now? Pontius Pilate and Jesus Christ met face-to-face in private. Jesus stood before Pilate and was asked, "Are you the King of the Jews?" Jesus responded with a quick, "It is as you say." The full account is written in John 18:33-37. Pilate knew Jesus posed no threat to him or Rome and he found Jesus intriguing. Pilate was clueless about Jesus' "Kingdom that was not from this earth." Pilate had no spiritual understanding, whatsoever. When Jesus said he bore witness to the truth and "Everyone who is of the truth hears My voice," Pilate rhetorically pondered, "What is truth?" That was a popular philosophical question back in their day and a question that only Jesus could answer. Jesus is the truth (John 14:6) and he was the Answer standing inches away from the one who asked. Jesus knows the thoughts of all men (John 2:25-26). Those times a genuine seeker wants the truth, Jesus immediately responds. He didn't respond to Pilate. Have you sincerely sought ultimate truth in your life? If not, humbly ask Jesus to reveal it to you. If it's your day of salvation he will respond with his truth, and the Holy Spirit will fill your soul with new life. Meanwhile, the Sanhedrin found willing participants for their growing riotous mob. They kindled the flames of the burgeoning crowd with rumors, slander, and outright lies. They were prepared to respond to Pilate's verdict. Their goal was the crucifixion of Jesus Christ and nothing would get in their way. Pontius Pilate appropriately judged Jesus Christ an innocent man. He wasn't fooled by the lies and innuendo of The Council (John 18:38). He could have released Jesus, or kept him protected under guard. Pilate brought Jesus before the large mob and announced the innocent verdict. The judgment enraged the crowd. More accusations ensued. Ugly insults rained upon Jesus. The roar from the mob became deafening. They wanted the crucifixion of Jesus and they weren't leaving without it. Pilate wanted and expected a response from Jesus. He had already been declared innocent, but Pilate wanted him to fire back and squelch the uprising. Jesus said nothing. There was nothing to say. Nothing worthy of a response. The events leading to the crucifixion of Jesus continued. Pilate marveled at this silent man. He was taken aback (Matthew 27:12-14). Don't forget this fact: Pilate loved to agitate the Sanhedrin. He was their antagonist, relishing every opportunity he received to frustrate them. However, he couldn't push them over the edge, because if they ran to Rome and Tiberius yet again, he would lose his coveted position. He couldn't take the risk. Pilate considered the mob's reaction as an appeal. Therefore, he sent Jesus and The Council to King Herod Antipas, who happened to be nearby in the palace. After a round of questioning by the perverted and strange king, Jesus maintained his silence. Herod Antipas, who had earlier killed John the Baptist (Matthew 14:1-12), grew frustrated with Jesus and insulted and mocked him (Luke 23:11). However, he sent him back to Pilate as a man unworthy of death. The responsibility for the crucifixion of Jesus can't be placed at Herod's feet. So, Pilate once again has Jesus Christ at his door. What now? Pontius Pilate decided to reach a compromise with the Sanhedrin, so he sentenced Jesus to a Roman scourging, with a subsequent release planned (Luke 23:13-16). But first, he wanted to attempt one last action to free Jesus. Pilate called upon the custom of releasing a choice of one of two or three convicted Jewish prisoners at Passover. It was brilliant, Pilate thinking that the crowd would send the popular Jesus to freedom as opposed to Barabbas, a notorious criminal. This wasn't the case, as the chants rained down to free Barabbas. They wanted the crucifixion of Jesus. Pilate's wife intervened at one point during the trials related to the crucifixion of Jesus, telling Pilate she had frightening dreams about the Christ. She referred to Jesus as a just man. The governor faced a tremendous dilemma: Free Jesus and lose his position, or crucify an innocent man? The crucifixion of Jesus was suddenly an imminent possibility. Pilate was torn. Pilate, in utter disgust of losing this battle to the Jews, washed his hands of Jesus' verdict. The Jews accepted the future guilt, if proven wrong. Jesus was ordered to undergo a Roman scourging. After the horrific ordeal, Pilate called the beaten Jesus to the fore, saying, "Behold, the Man!" He was hoping the scourging had been enough for the Jews and that they would relent. The Sanhedrin called for the crucifixion of Jesus. They wanted him dead, and dead NOW. Pilate was done with the situation, "You take him and crucify him, for I find no fault in him." Pontius Pilate and Jesus were still together when a certain allegation against Jesus was heard by Pilate. Someone shouted "He ought to die, because he made himself the Son of God!" This shocked Pilate, who didn't believe in Judaism, but did know and understand the Roman teachings about the consequences of angering the gods. He immediately pulled Jesus aside, asking, "Where are you from?" More silence. Pilate pressed him for an answer, "Do you not know that I have the power to crucify you, and power to release you?" Jesus stated, "You could have no power at all against me unless it had been given you from above. Therefore the one who delivered me to you has the greater sin." Judas Iscariot and The Council have LOTS to answer for on their personal judgment days. Pilate realized he was facing something much greater than what he had previously thought. His wife warned him about the atrocity of sentencing this particular righteous man. 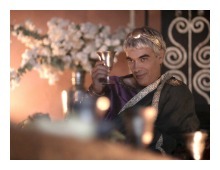 Herod found nothing wrong with him. Jesus was innocent. Pilate knew envy drove this riotous mob to seek the crucifixion of Jesus. The fact that Jesus told him the Sanhedrin had the greater sin didn't seem to comfort Pilate. The gravity of the moment almost crushed the indecisive governor. Finally, he asked The Council, "Shall I crucify your King?" They shouted, "We have no king, but Caesar!" Jesus the Lamb of God was led away to the slaughter (John 19:14-16). The Council won and the crucifixion of Jesus would soon be part of human history. The Sanhedrin, King Herod and Pontius Pilate had no power over Jesus. The crucifixion of Jesus was a pre-ordained mission. God allowed the evil of humanity to play out in full, in this case. 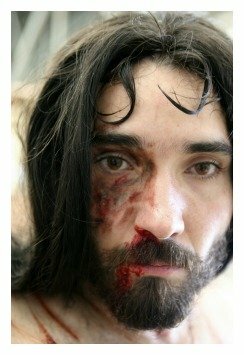 The innocent, sinless Jesus was mocked, beaten, tortured and finally crucified like no other person in history - guilty or innocent. The pride, hate and evil found within natural men led to the total physical destruction of Jesus the Lamb of God. Man, left to his own devices, killed the Son of God. The crucifixion of Jesus, God's Son, is the extent of evil that occurs when God grants humans free reign. Please don't ever trust man, especially with the salvation of your soul. This lesson proves the mistake of doing such a thing. Jesus knows what is in a man, so learn from him! (John 2:24-25). Don't trust religious institutions. Don't trust political leaders. Placing your trust in these man-made organizations leads to destruction. You won't answer to them on your personal judgment day, so trust the most perfect One, Jesus Christ. He will be your Judge. Trust his word, the Holy Bible. Jesus Christ gives you everything you need for eternal life. 1) Is it possible for a politician, such as Pilate, to fully follow the law and truth, even while being pressured by the misguided vocal minority? 2) The Roman government became a co-conspirator because they allowed an innocent man to be crucified. Jesus told him the greater sin was done by the Sanhedrin. What does this tell you about Judgment Day? 3) What is Truth? Who is Truth? What does one do with Truth? After sharing this Bible study lesson on Facebook or Twitter below download your FREE printable Bible Study Lessons (pdf version): Crucifixion Of Jesus, Lesson 2.19. 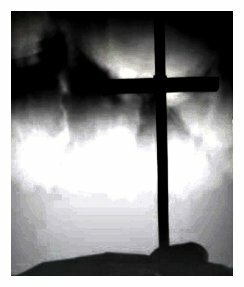 Special Note: I'm grateful to Big Book Media & Free Bible Images, Stock Exchange, Morgue Files, and Stock Photos For Free for the use of their photos for Crucifixion of Jesus Bible study lesson.